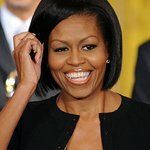 First Lady Michelle Obama today announced that Sesame Workshop and the Produce Marketing Association (PMA) joined the Partnership for a Healthier America (PHA) in a two-year agreement to help promote fresh fruit and vegetable consumption to kids, making healthier choices a little easier for families to make. The agreement allows PMA’s community of growers, suppliers and retailers to take advantage of the Sesame Street brand’s strength and influence without a licensing fee, using characters like Big Bird, Elmo and Abby Cadabby to help deliver messages about fresh fruits and vegetables. Sesame Street characters may be on produce in stores as early as mid-2014. In her remarks, the First Lady referenced a recent study published in the Archives of Pediatrics and Adolescent Medicine conducted by Cornell University researchers. Kids were given a choice between eating an apple, a cookie, or both and the vast majority chose the cookies. But when the researchers put Elmo stickers on the apples and let the kids choose again, nearly double the number of kids went for the apple. PHA works with the private sector and PHA Honorary Chair First Lady Michelle Obama to broker meaningful private sector commitments to end the childhood obesity epidemic. Visit ahealthieramerica.org for additional information about the Sesame Workshop and PMA commitments.